LB110, introduced by Lincoln Sen. Anna Wishart, would create a framework for legalizing medical cannabis use in Nebraska. Wishart introduced an amendment that, if adopted, would replace the original bill. As amended, it would create a new state regulatory agency—the Cannabis Enforcement Department—that would be tasked with reviewing and approving applications for medical cannabis use. Wishart said a 2017 study shows that over 70 percent of Nebraskans support legalizing medical cannabis. While supporters span the political, age and geographic spectrums, she said, they all share a common desire to help those struggling with chronic illnesses who could be helped by medical cannabis. At one time cannabis was used in 27 different legally available medicines in the U.S., Wishart said, before an outright prohibition movement began in the 1920s. While cocaine can legally be prescribed for medical purposes today, cannabis cannot, she said. Registered medical cannabis users could purchase cannabis through regulated in-state dispensaries or home delivery from out-of-state suppliers. Patients would be limited to no more than three ounces of marijuana on their person, eight ounces at home and infused products with no more than 2,400 milligrams of THC. LB110 would prohibit any registered user of medical cannabis from driving, operating a boat, train or aircraft, or undertaking any task that would be negligent or constitute malpractice while under the influence of cannabis. They also could not work on transportation property, equipment or facilities. Medical cannabis would not be covered by the medical assistance program under the bill and private insurers would not be required to cover its costs. Any registered user who sells their medical cannabis would suffer immediate revocation of their registration card. 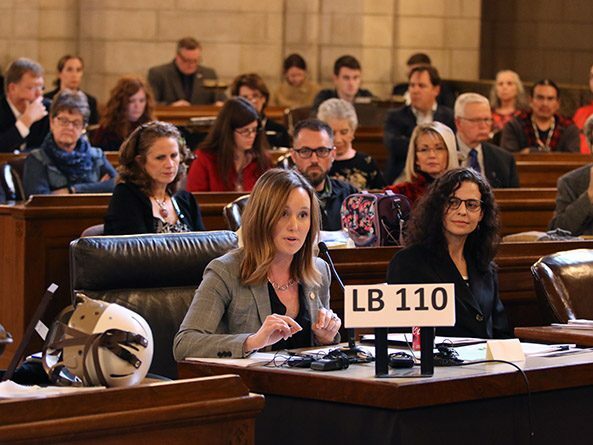 Representing Nebraska Families 4 Medical Cannabis, Shelley Gillen spoke in support of the bill, saying the state is forcing families of sick children to make incomprehensible decisions to either purchase cannabis illegally or sit by and watch their children suffer. She said arguments that the state should wait for approval by the Federal Drug Administration—or that medical cannabis is a gateway drug—are nothing short of insulting. Retired Marine Carl Munford also spoke in support of LB110. He said exposure to nerve gas while serving in the first Gulf War has led to PTSD and chronic pain. One trip to Colorado proved to him that medical cannabis could replace the 20 medications he currently takes, Munford said. Opposing the measure was Mary Hilton, who said her daughter continues to experience 30 to 50 seizures daily, despite medication. Medical cannabis is not the silver bullet desperate families are looking for, she said, adding that much more research is needed on the matter. Col. John Bolduc, superintendent of the Nebraska State Patrol, also opposed the bill. During the time he served in the California State Patrol, he said legalized medical cannabis was diverted to an illegal black market, exacerbating public safety problems. John Massey, a pain physician testifying on behalf of the Nebraska Medical Association, provided neutral testimony. Massey said the NMA could support a more narrowly-tailored bill that better fits the most recent scientific evidence. Data shows that medical marijuana can be beneficial for a narrow set of disorders including muscle spasms related to multiple sclerosis, he said, but cannabis often worsens depression, anxiety and PTSD. “It’s pretty clear that a lot of the information that comes forward and the data and so forth—that the people who bring it forward start with their opinion and then they find their data to support that, and I think that’s a problem in this set of circumstances,” Massey said.